EASTON - Geraldine Ort, 53, of 125 W. Lincoln St., died Tuesday (February 25, 1992) in her home. She worked as an inserter for The Express for 10 years before retiring three years ago. Prior to that, she was a teacher's aide for Head Start of the Lehigh Valley. Born june 10 1938, in Easton, she was a daughter of the late Emmet and Elizabeth Mae Schlough Hazen. She was a member of St. Paul's Lutheran Church in Easton. She and her husband, Henry A. Ort Sr., were married for 35 years. 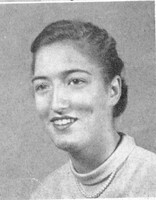 Surviving in addition to her husband are two sons, Henry A. Jr. and Wayne S. both at home; five daughters, Sally Jo Mitchell of Allentown, and Margie Lee McCullen, Connie Mae Ort, Patty Ann Ort, and Carol June Ort, all of Easton; four sisters, Betty Jane Martin of Easton, Virginia Shrope of Forks Township, Carolyn Schreiner of Acworth, Ga., and Cynthia Smith of Williams Township; and 10 grandchildren. Services will be held at 10 a.m. Friday in the Shillinger Funeral Home in Easton. Inrerment will be in Northampton Memorial Shrine in Palmer Township.